Google File System to MapReduce to Bigtable and to Borg. From the beginning, we’ve known that great computing infrastructure like this requires great datacenter networking technology. But when Google was getting started, no one made a datacenter network that could meet our distributed computing requirements. So, for the past decade, we have been building our own network hardware and software to connect all of the servers in our datacenters together, powering our distributed computing and storage systems. Now, we have opened up this powerful and transformative infrastructure for use by external developers through Google Cloud Platform. Taken together, our network control stack has more in common with Google’s distributed computing architectures than traditional router-centric Internet protocols. Some might even say that we’ve been deploying and enjoying the benefits of Software Defined Networking (SDN) at Google for a decade. A few years ago, we revealed how SDN has been powering Google’s datacenter WAN, B4, one of the world’s biggest WANs. Last year, we showed the details of GCP’s SDN network virtualization stack, Andromeda. In fact, the architectural ideas for both of these systems come from our early work in datacenter networking. Building great data center networks is not just about building great hardware and software. It’s about partnering with the world’s best network engineering and operations team from day one. Our approach to networking fundamentally changes the organization of the network’s data, control, and management planes. Such a fundamental shift does not come without some bumps, but our operations team has more than met the challenge. We’ve deployed and redeployed multiple generations of our network across our planetary-scale infrastructure to keep up with the bandwidth needs of our distributed systems. 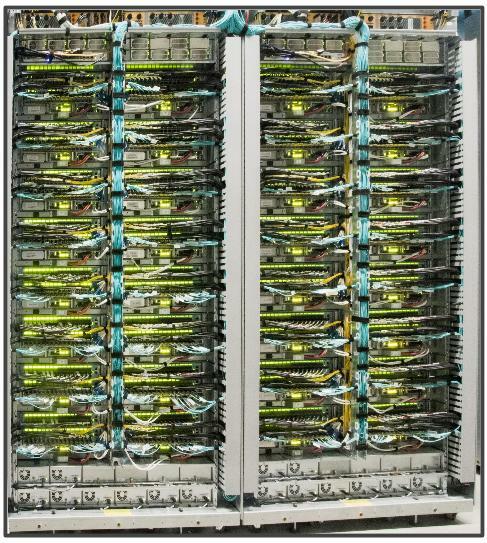 Putting all of this together, our datacenter networks deliver unprecedented speed at the scale of entire buildings. They are built for modularity, constantly upgraded to meet the insatiable bandwidth demands of the latest generation of our servers. They are managed for availability, meeting the uptime requirements of some of the most demanding Internet services and customers. Most importantly, our datacenter networks are shared infrastructure. This means that the same networks that power all of Google’s internal infrastructure and services also power Google Cloud Platform. We are most excited about opening this capability up to developers across the world so that the next great Internet service or platform can leverage world-class network infrastructure without having to invent it. Google has long been a pioneer in distributed computing and data processing, from Google File System to MapReduce to Bigtable and to Borg. From the beginning, we’ve known that great computing infrastructure like this requires great datacenter networking technology. But when Google was getting started, no one made a datacenter network that could meet our distributed computing requirements.